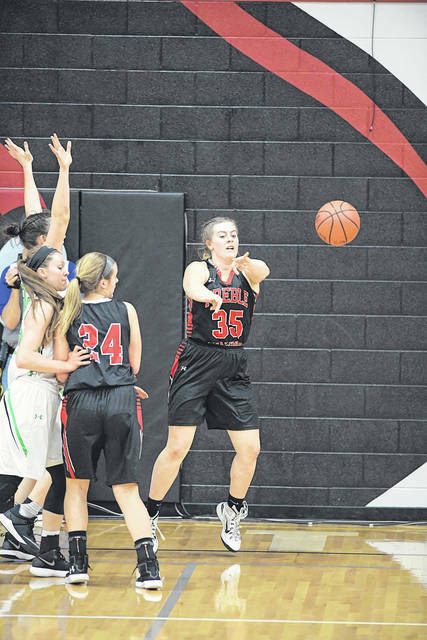 Preble Shawnee junior Nicole Sims drives to the basket during the Arrows sectional championship game against Anna on Tuesday, Feb. 27. After a fast start, the Arrows offense stalled in a 36-24 setback. Preble Shawnee coach Kevin Schaeffer discusses strategy with assistant coach Rob Turpin during the Arrows Division III sectional final game against Anna. Shawnee’s season came to an end with a 36-24 loss. 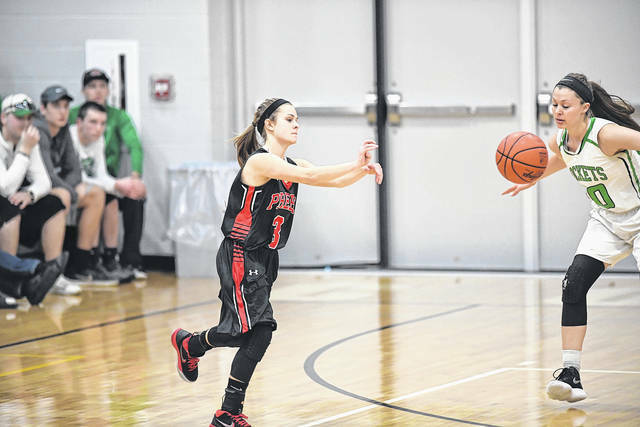 COVINGTON — Preble Shawnee’s girls’ basketball team was looking to win its first sectional title in nearly three decades and after the start they got off too in the sectional final things looked promising. But after the fast start, Anna locked down the Arrows 36-24 to win a Division III sectional championship at Covington High School on Tuesday, Feb. 27. The victory avenged last season’s 39-32 sectional loss to Preble Shawnee. Seventh-seeded Shawnee (18-6) picked up where it left off from last season’s meeting. Junior guards Jenna Lovely and Nicole Sims combined to score 10 of the game’s first 12 points, including a pair of 3-pointers from Sims. Shawnee led 10-2 in the first 2:41 of the game. It was all No. 6 Anna (19-6) after that. 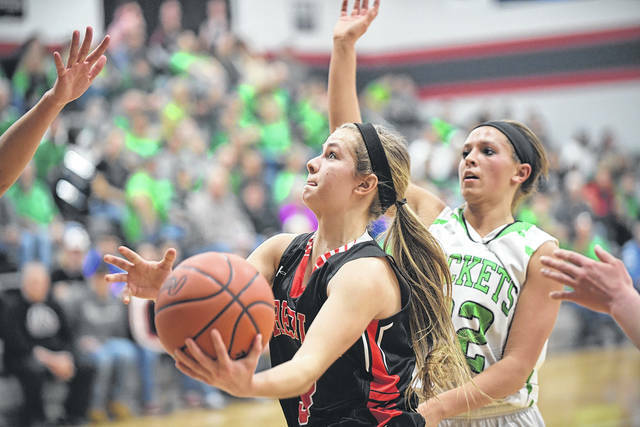 The Rockets unleashed a 17-0 run — highlighted by senior Macey Huelskamp’s nine points — that carried them to a 19-10 lead early in the second quarter. The lead was 23-15 at the half. 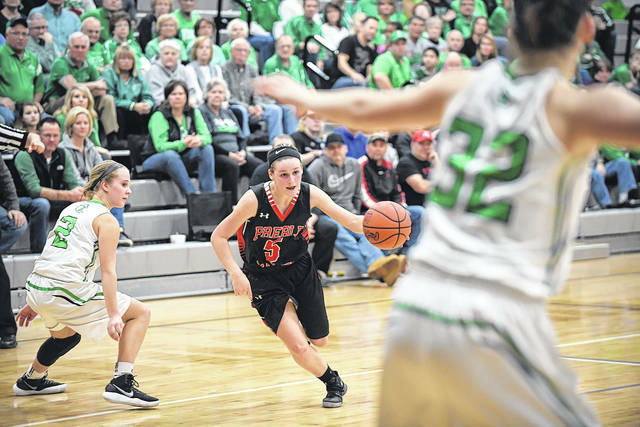 With Anna’s patient, work-the-perimeter ball controlled offense receiving a variety of help, the defense put the finishing stamp on the win by holding Preble Shawnee to two points in the fourth quarter. As for Lovely and Sims, who entered the game combining for 21.5 points per game, they went scoreless the final 29:19 after their scoring outburst. 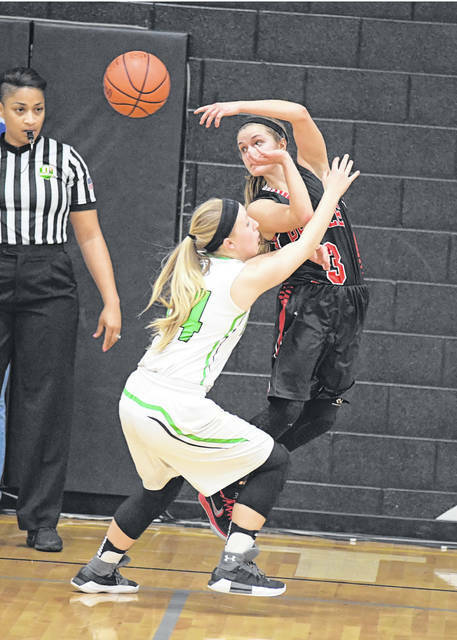 Sims led Preble Shawnee with six points, junior leading scorer Brenna Woodard had five and Lovely four. 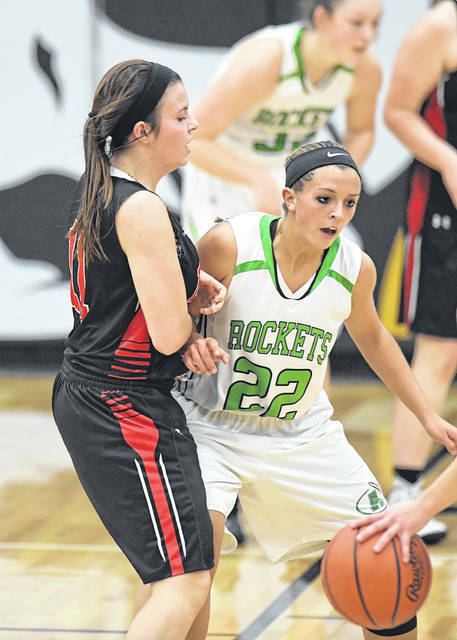 Huelskamp led Anna with 16 points. She scored four straight to end the first quarter, then capped the 17-0 run with a 3-pointer early in the second quarter. 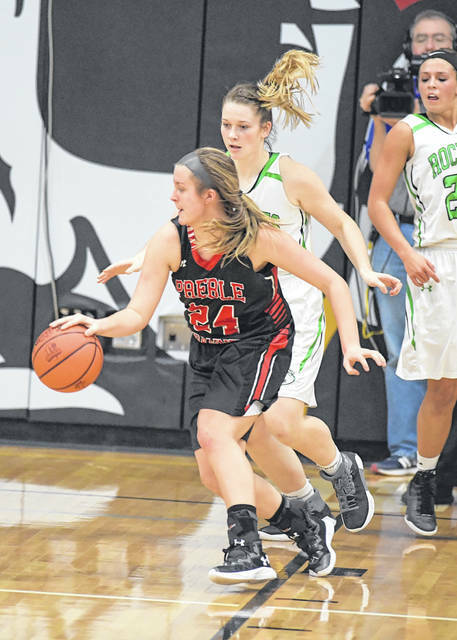 She helped keep Preble Shawnee at bay in the third quarter, too. A free throw and basket off an offensive rebound — started by freshman Ella Doseck’s steal — put the Rockets up 30-20. Huelskamp added a block moments later. The Rockets also picked up key contributions from senior Abby Gaydosh, who scored five of her six points in the first quarter. Senior Jada Rowland stepped up in the second quarter with five of her seven points. And Gaydosh, Doseck and sophomore Michaela Ambos all hit free throws in the fourth quarter. 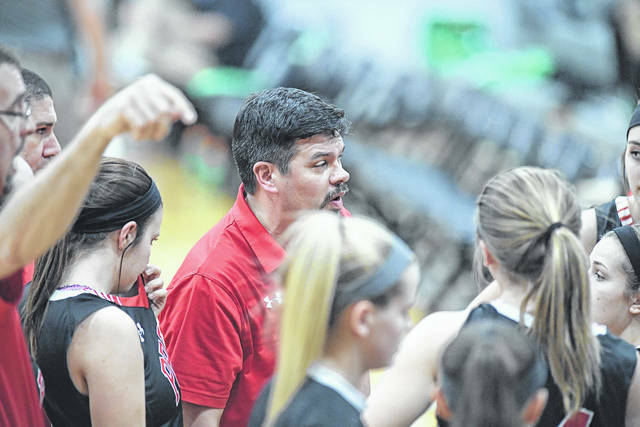 The 24 points was a season low for Preble Shawnee, which hadn’t scored less than 37 points prior to Tuesday. The Southwestern Buckeye League team entered the game averaging 53.1. And the Arrows looked on their way to hitting that with their fast start against Anna. https://www.registerherald.com/wp-content/uploads/sites/41/2018/03/web1_psgbk2.jpgPreble Shawnee junior Nicole Sims drives to the basket during the Arrows sectional championship game against Anna on Tuesday, Feb. 27. After a fast start, the Arrows offense stalled in a 36-24 setback. 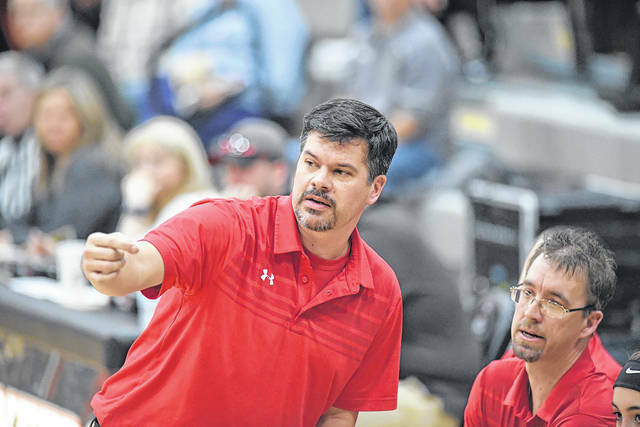 https://www.registerherald.com/wp-content/uploads/sites/41/2018/03/web1_psgbk5.jpgPreble Shawnee coach Kevin Schaeffer discusses strategy with assistant coach Rob Turpin during the Arrows Division III sectional final game against Anna. Shawnee’s season came to an end with a 36-24 loss.